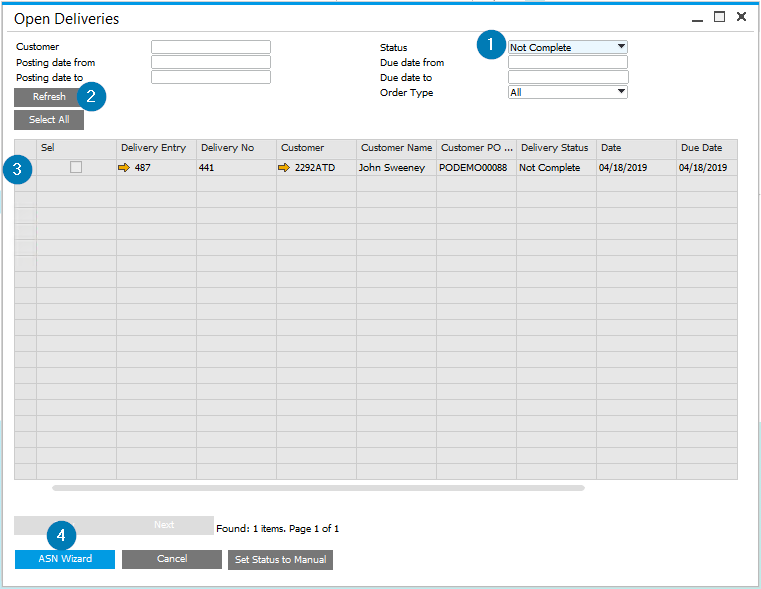 To process Deliveries, use the standard SAP Business One Delivery document window for processing Packaging and Deliveries. To edit an Open Delivery, use the Open Deliveries function. Right-click (or Go To) on the Delivery to go to Packing Slip. Edit the Delivery document to process the Delivery, as described below. User Defined Fields used in processing Deliveries are also used by Sales Order and Invoice documents, and are described in Processing Sales Order Documents - Fields used to Process a Sales Order, Delivery or Invoice. Additional EDI Documents button which can be found on the delivery screen. 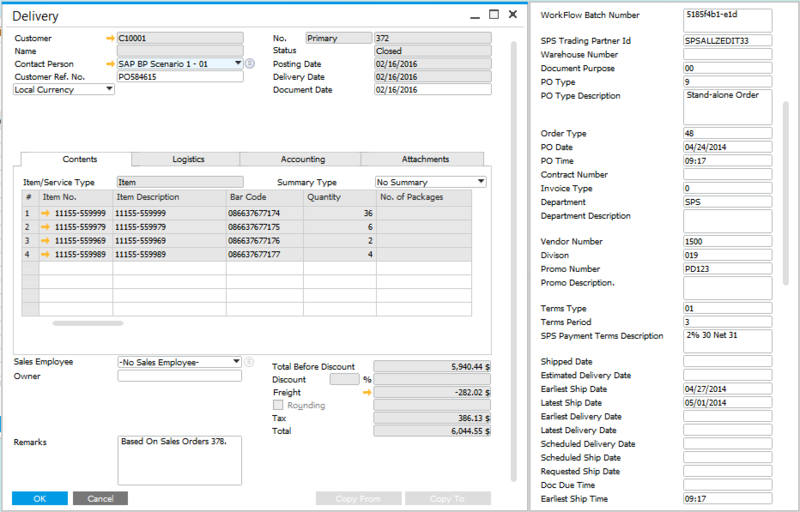 For deliveries which originated from an SPS integrated purchase order, the “Additional EDI Documents” button will be shown. This button will open the default web browser and navigate to the SPS Portal. The customer purchase order number (Customer Ref No) will be used to find the related purchase order document in the SPS Portal. See Additional EDI Documents for more information. ASNs (Advanced Shipping Notices) are created by selecting deliveries with status ‘Not Complete’ in the Open Deliveries view. This will open the Advanced Ship Notice Wizard Step 2 window for population and adding the ASN. In the Open Deliveries window, apply a filter with status set to Not Complete to view Open Deliveries that can be configured with ASN details, as shown in the screenshots below. Select the Not Complete filter option (1) and refresh (2) to see latest deliveries. 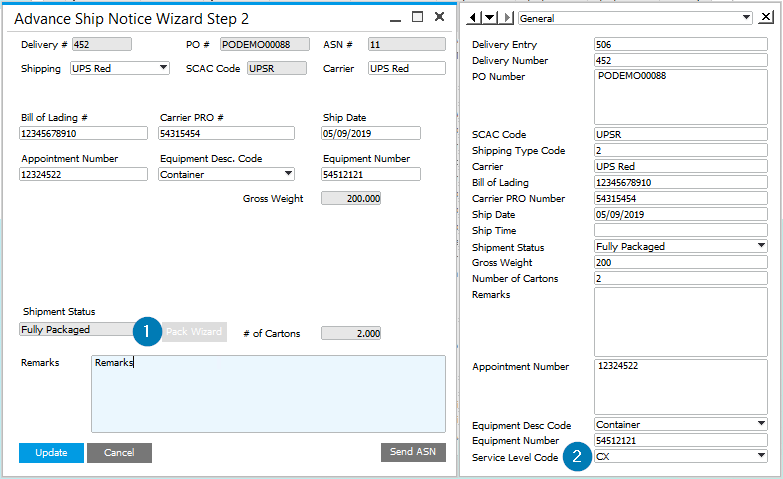 Select a delivery (3) and press the Create ASN button (4) to open the Advanced ship Notice Wizard. Fill in the ASN fields, as described below. Make note of required fields. Update packaging information with the Pack Wizard (1). Update the Service Level Code (2) if required. Important: Except for Service Level Code, don't update the UDFs, use the Wizard fields to do this. UDF values are updated automatically when you update the fields within the ASN Wizard. Service Level Code is the only field that doesn't have a Wizard field. Once the ASN is created, it may be viewed in the ASN Listing. Delivery Number assigned to the delivery document. This field is read-only, as populated from the Delivery document. Purchase Order Number set on the delivery document. This field is read-only, as populated from the Delivery document. Advance Shipping Notice identifier. This number is for use within SAP Business One only. Shipping method, as configured in SAP Business One. Standard Carrier Alpha Code. This identifies the Carrier, if applicable. The SPS Shipping Carrier, as configured for the selected Shipping option. Provides an overview of whether the shipment is complete, in progress or not yet started. This status is dependent on related Delivery documents. If all related deliveries are complete, this will be marked as such. The Pack Wizard (marker 1 in the screenshot above) may be used to update delivery documents directly. A summary of shipment cartons, as configured within the related deliveries. Remarks may optionally be added to provide context for the delivery. This UDF may be updated manually, if required by your specific Carrier. Also sometimes referred to as "Speed Code".